The Child bounced back from her Canada trip and its fallout. At first it went slowly – she couldn’t find a way to sit next to the people she wanted to sit with at lunch, sometimes leaving the cafeteria in frustration. But one day, some other girls leave the cafeteria with her, and after a while, still other girls save seats for her. She musters up the courage to invite a new girl over, and the invitation is accepted, followed by another, until finally, she starts to receive invitations too, and life settles back into a normal teenage girl routine of sleepovers, trips to the mall, and entire evenings spent on the phone with the same people she spent the entire day with. She starts to nibble at bacon, and then to talk about chicken nuggets – long shunned, but once the staple of her diet – and one day announces that she just really wants some chicken nuggets and that’s really all there is to it and can we please go to Red Robin right now? I’m so startled by this development that I take her, and as we have dinner, she talks about all the foods she misses: chicken nuggets, chili, turkey sandwiches and spaghetti with real meatballs, do I know how to make those? No, I tell her, but I can learn. I never minded her refusal to eat meat, it was the refusal to eat nearly everything that was a hardship to me. Everything was too spicy, or tasted funny, or she just didn’t like it for reasons that she couldn’t explain; worse, sometimes she’d raise my hopes by liking something the first time I made it but then not liking it the next time. The few things she did seem to like, she’d get bored with after a while, though not usually as quickly as I got bored with them and never waiting until I’d found a replacement for the rejected food. Suddenly, she’s eating it all. Sometimes, she even has seconds. I don’t even know where to begin – my cookbooks are all new again, no longer full of mostly things she won’t eat, but potentially things she might enjoy. At the moment, like most of America, she’s obsessed with bacon, so my first efforts are focused on breakfast, although breakfast could happen at any time of day. I found these Toasted Coconut Waffles when I was on the hunt for a way to use up some extra buttermilk I had bought (for a sherbet recipe that went oddly astray), and since I love all things coconut and The Child – for the moment, at least – loves anything with a side of bacon, I made these for an Easter breakfast. They mix up in a snap and are light and fluffy and coconutty, yet crispy, not soggy or heavy the way some waffles can be. The recipe makes a good amount, and we had easily 8-10 waffles, so we had some extra to freeze and snack on. I was worried that the maple syrup might not be a good mix with the coconut, but I was very wrong – the two flavors complemented each other just perfectly, and the waffles taste a bit incomplete without syrup. 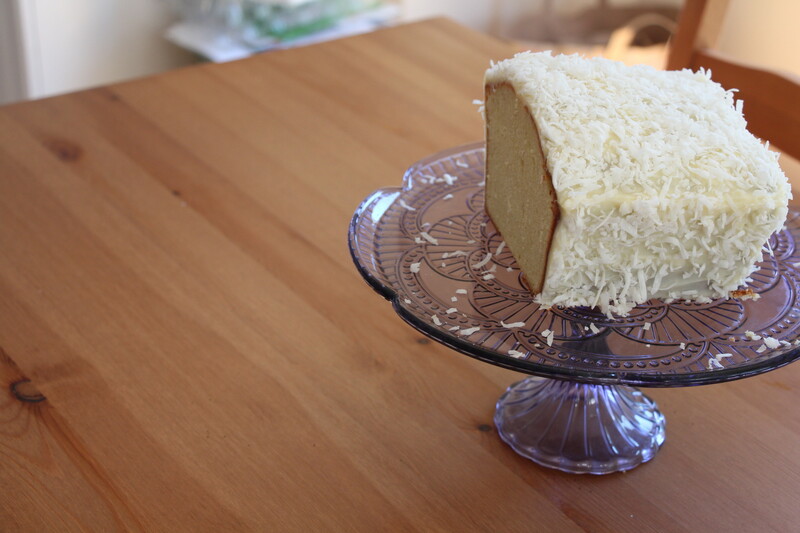 Definitely scatter some extra coconut on top, the added crunch is wonderful. One note: I didn’t use the virgin coconut oil called for in the recipe, as it was twice the price of regular coconut oil, and much as I love coconut oil, it’s spendy enough as it is, thank you very much. 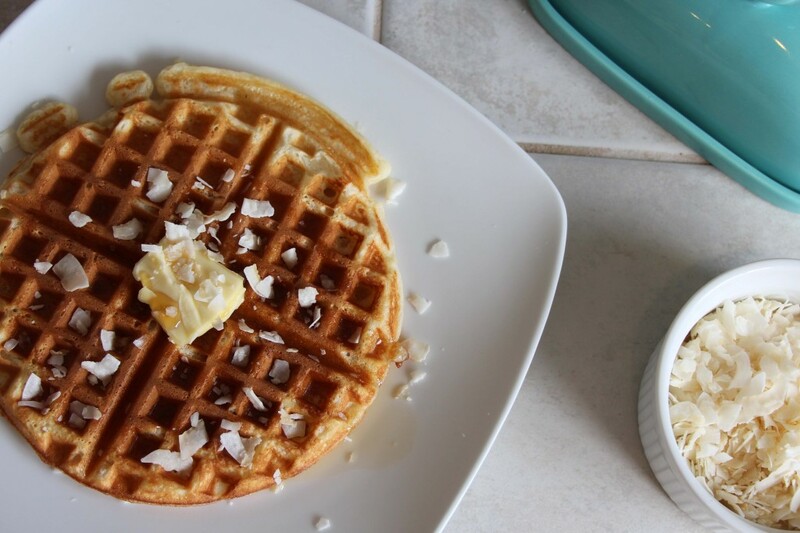 The waffles have plenty of coconut flavor without the added cost. Preheat oven to 400°. 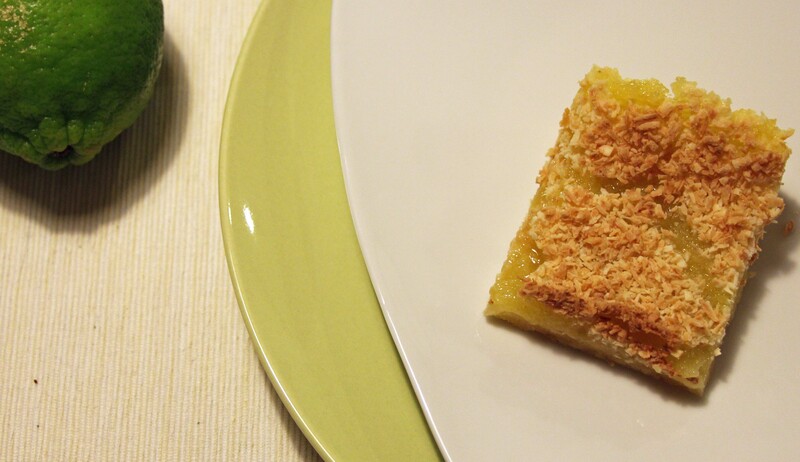 Toast coconut on a rimmed baking sheet until golden brown, about 2 minutes. Let cool. Whisk flour, cornstarch, salt, baking powder, and baking soda in a large bowl. Whisk eggs, buttermilk, milk, oil, and sugar in a medium bowl. Whisk buttermilk mixture into dry ingredients. Mix in ¾ cup coconut; set aside remaining coconut.